"Vandermark’s music is a moving target. Wired For Sound was recorded in September 2017, and since then the group has toured the Southern USA. If their final Chicago date, which occurred a couple weeks after that tour, is any indication, they’ve grown more fearless and forceful. Here’s hoping that this band stays together for a spell; it’d be great to hear what comes next." Recorded on September 29th, 2017 by Alex Inglizian and Ralph Loza at Experimental Sound Studio, Chicago. 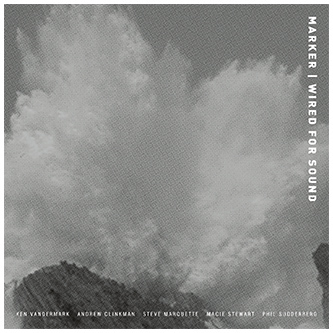 Mixed by Alex Inglizian and Ken Vandermark with assistance from Andrew Clinkman, Steve Marquette, and Phil Sudderberg at Experimental Sound Studio. Thanks to the musicians, to Adrienne Pierluissi for giving Marker a weekly residency at the Sugar Maple in Milwaukee during August of 2017, and to the listeners.